"CONCH HEAVEN" ~ Stylish 2B/2Ba, Sleeps 6 in Old Town, Cocktail Pool & Grill! Property 3: "CONCH HEAVEN" ~ Stylish 2B/2Ba, Sleeps 6 in Old Town, Cocktail Pool & Grill! "SOUTHERNMOST BELLE"~ Heated Pool, Gourmet Kitchen & Elegant Large Bedrooms! Property 5: "SOUTHERNMOST BELLE"~ Heated Pool, Gourmet Kitchen & Elegant Large Bedrooms! Free standing private home in a 6 unit complex with pool in old town Key West. Property 7: Free standing private home in a 6 unit complex with pool in old town Key West. HISTORIC RESTORED 'EYEBROW' HOME. REDUCED PRICES !!! Property 8: HISTORIC RESTORED 'EYEBROW' HOME. REDUCED PRICES !!! Brand New! Ohana Paradise At The Historic Seaport , Old Town. Private Home. Property 9: Brand New! Ohana Paradise At The Historic Seaport , Old Town. Private Home. "BLUE ROOSTER" ~ Spectacular 4 Bed/4 Bath with Pool and Solarium in Old Town! Property 11: "BLUE ROOSTER" ~ Spectacular 4 Bed/4 Bath with Pool and Solarium in Old Town! "ISLAND TIME" ~ Fully Renovated Conch Home in a Great Old Town Location! Property 14: "ISLAND TIME" ~ Fully Renovated Conch Home in a Great Old Town Location! "THE SEASHELL" ~ Classic, Luxury Old Town Gem with Private Pool & Gardens! Property 17: "THE SEASHELL" ~ Classic, Luxury Old Town Gem with Private Pool & Gardens! William Skelton Home - Heart of Key West - Save 10% on Your 5+ Night Stay! Property 21: William Skelton Home - Heart of Key West - Save 10% on Your 5+ Night Stay! Spacious home w/ private hot tub, back patio, and awesome location! Property 25: Spacious home w/ private hot tub, back patio, and awesome location! Family and dog-friendly island condo w/ full kitchen and a great location! Property 26: Family and dog-friendly island condo w/ full kitchen and a great location! Property 28: Seaport Treasure Estate ~ Three Key West Historic Seaport Properties. 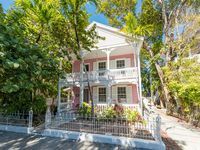 Property 29: ~ CASA KEY WEST (NEW!) ~ Historical Home w/ Plunge Pool In PERFECT Location. Property 36: PARADISE IN OLD TOWN!!! "STARS AND STRIPES" ~ Magnificent Home Located In The Heart of Old Town! Property 38: "STARS AND STRIPES" ~ Magnificent Home Located In The Heart of Old Town! Unique and beautifully renewed house in the heart of downtown, Key West. Property 41: Unique and beautifully renewed house in the heart of downtown, Key West. Property 49: “STONE'S THROW” ~ 2 Bedroom Conch Cottage with Pool, its a PERFECT LOCATION! Fantastic Time in Key West! Our family had 12 people going down to Key West so we decided to rent a house. The property was perfect and I highly recommend it if you are taking a large group instead of going to a hotel. We were all together and the kids enjoyed the pool! It was perfect walking distance to many restaurants and of course just off Duval which was great in itself! We had a wonderful stay in this house. It is very clean, newly renovated, and well equipped. Lots of great amenities including nice and new appliances, washer and dryer, and a great property manager with awesome local recommendations. The private pool is small but very nice. The location is very convenient. The house is only one block away from the central section of Duval Street, a few blocks away from the Historic seaport, and about 1 mile from Fort Zach, so close to a lot of tourist spots, restaurants, coffee and breakfast spots, etc! The street does have some street traffic but it isn&rsquo;t too bad, but it&rsquo;s not on the quietest street. It&rsquo;s a few blocks from the fire station so you may hear sirens a few times a day. Overall I would recommend staying at this property.